SNES Central> During the 16-bit era, you worked with Visual Concepts. How did you come to work with them, and what were your major roles in the development process? Eric Browning> I was in art school, right at the end, and had been working my way through college. I finally decided to quit my two jobs and force myself to find freelance art jobs. That's when VC posted an ad on the job board at my school- a position that required "cartooning, storyboarding, animation, concept art" etc etc. It was like a dream job- and while I felt woefully under qualified I needed to pay rent, so I went for it. VC was about 12 guys at the time. I actually wasn't aware that console games were doing so well- and when I got to the interview Greg Thomas showed me the Super Famicom- which was to be released in the states in a matter of months. I was floored- I'll never forget looking at Actraiser- I grew up on pong in the 70's and the early '80s stuff. Here was fantastic music, big, beefy sprites and rich backgrounds. I didn't know anything about computers but in that moment I wanted to do games more than anything in the world. SC> How many SNES games did you work on and what were the titles? EB> I think 6, the only one not on my resume was "Lester the Unlikely". I was Lester - rotoscoped in. One of those games that starts out way too ambitious, and ends up merely adequate. There were many games that never saw the light of day- many more than actually get developed. SC> What is the process that you go through when you are creating artwork for a video game? EB> That's a big question- with the SNES you were so confined we all tended to wing it- very little preproduction work. Now, we all do a lot more planning before starting creation of assets- games are big now and expensive, you can't just run in and make art without a plan. So I do drawings of what I intend to make, and run it by the designer and geometry guys, and then start my end, which is painting. Sometimes I just do concept work and hand it off. SC> On your resume, it says that you worked on Clayfighter. Were you involved in the claymation aspect of this? If so, what was that like? EB> I had to think about that one- I forgot what I did! I did a lot of the backgrounds- that was fun work. The claymation was done by Danger Productions- they had a short lived TV show called "Bump in the Night", also claymation. SC> You worked on a game called Mickey's Learning Adventure for the SNES. I was unable to find any information on this game. Was it released? What was it like to do the artwork for one of the most recognizable characters in animation? EB> Mickey never saw the light of day. It was complete, I can't remember what happened. I tried animating Mickey- but Disney does not mess around with that guy and I simply am not trained as an animator. We sent it to Little Gangsters in L.A, an animation house Disney worked with. They did amazing animation- I was humbled by that. 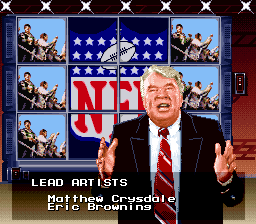 SC> What were the hardest parts of creating artwork for the SNES? EB> The limitations, but what was tantalizing was that if you could juggle assets properly you could do amazing things- Capcom and Shiny proved that. strong>EB> The excitement of those days on the SNES. Going to CES and seeing the new games- I had stars in my eyes. The magic of seeing a character you made yourself start to walk around the screen- seeing your art on the Nintendo...I still love the SNES.